stopthewave.net The Texas Rangers issue an anti-wave warning on the video board at Rangers Ballpark. Texas Rangers fans have plenty to cheer about these days: Their team holds the American League pennant and currently leads the AL West. Whoop and holler all you want, Rangers fans. But whatever you do, don't do the wave. It's prohibited in Rangers Ballpark. 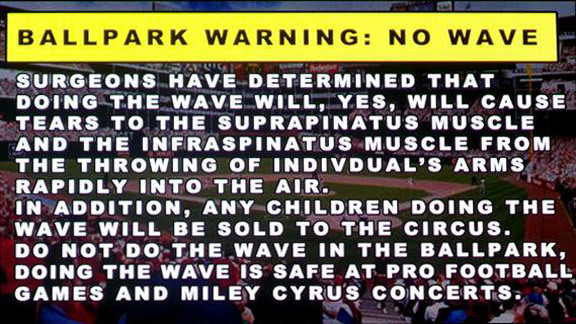 At recent games, a warning has appeared on the stadium's message board claiming the wave could cause injury and that children doing it will be sold to the circus. It does, however, say that "doing the wave is safe at pro football games and Miley Cyrus concerts." Obviously the warning, and the ban itself, are in jest. It's not official team policy, and there are no real consequences for wavers. But there is an actual motive behind it: Fans began complaining to team officials that folks prodding them to do the wave was ruining their ballpark experience. "I was getting lots of emails and Tweets from fans during the game asking me to do something to stop the wave," said Chuck Morgan, the Rangers' senior vice president for ballpark entertainment. "So I said, 'Let's see if we can have fun with it.'" One of those fans was Greg Holland, who runs www.stopthewave.net. than being stuck in a section with someone who is relentless in trying to get the wave started, especially if they're sitting in front of you," Holland said. "To me, doing the wave is basically giving the middle finger to the guys on the field. You're telling them you don't care about what's going on and that they are not entertaining you." Now, whenever there's a wave rising in Arlington, the new warning will appear, regardless if anybody actually heeds it. Which, Morgan said, they don't. Still, he said, "I'll probably keep doing it until somebody gets so mad they're not going to come to the game anymore. Or management tells me to stop." Or a Miley Cyrus concert breaks out.